I have been an amateur photographer for more than 40 years from my early teens. I have used all sorts of equipment from 5×4 sheet film technical cameras complete with dark cloth to tiny P&S digitals you can slip into a shirt pocket (and smart phones, of course). 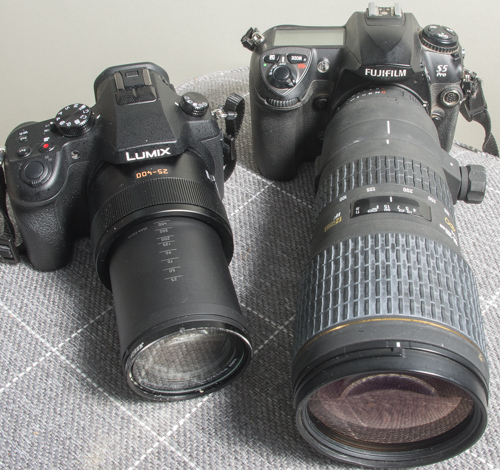 I felt digital SLRs had reached “good enough” for my uses by the time 12MP APS-C cameras hit the market (eg Canon 450D). Developments since then such as more pixels, less noise, more dynamic range, better focusing, faster operation and so on have been welcome but don’t really impact that much on my everyday photographing. What does, is size, weight and ergonomics. I’ve used a lot of cameras including early mirrorless models in the search for the camera/lens combination that felt right in the hand, had the controls how I like them and the operational convenience I like. I’m picky about these things because although I know my technical stuff, I have found over the years that I tend to be lazy, forgetful and careless in the field and make stupid mistakes. A camera that gets out of the way that I can operate without too much thought it a must for me. 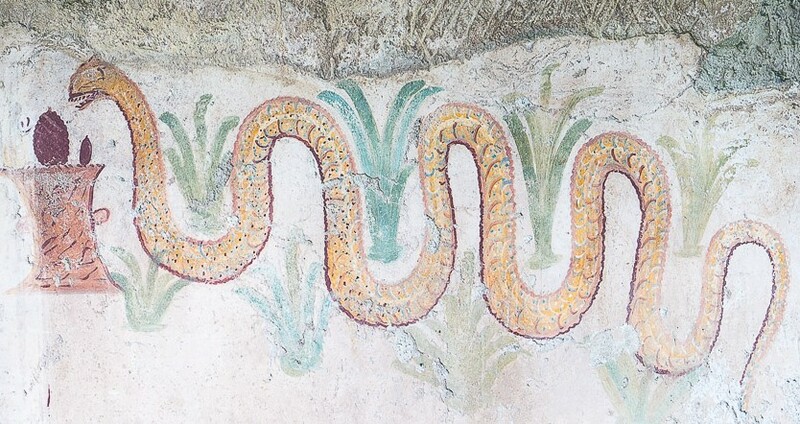 Others, who are calm and precise in the field may find this meaningless. My current “good enough” primary camera is a Panasonic Lumix G7. It is light, compact, more or less has the controls where I want them, has a decent electronic viewfinder, is quite customisable, is speedy and has image quality for stills and video that meets my needs. I print only A4/A3 desktop sizes so have no need of 50MP full frame behemoths. I also have the smallest, lightest lenses I can find (17mm pancake (35mm equivalent) and the 45-150mm (90-300mm equivalent). I still find it remarkable that I have good quality lenses that offer me a 35-300mm range (35mm equivalent) that weigh very little and can fit in a tiny bag barely larger than a lunchbox. We are blessed with gear these days. However, despite being (almost) satisfied with this outfit, I hate the fiddle of changing lenses even though I do it rarely, being mostly a medium tele shooter. Next year my partner has booked a safari in Zambia where she is hoping to combine painting with photography. We have been discussing what camera gear she should take and what she should have for a back up second camera. We thought we would give a good quality bridge camera a go, hence this blog. 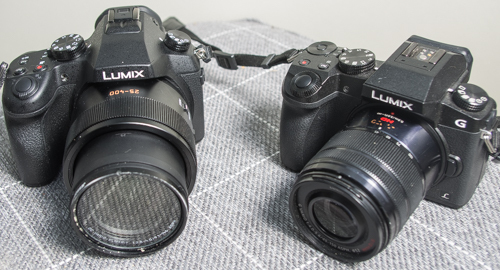 There have been two candidates for a few years that stand out above their tiny sensor bretheren: the Sony RX10 series and the Lumix FZ1000/2000 models. The FZ1000 is a few years old now, half the price it used to be and less than 1/4 the price of the current RX10 model, seemed worth a punt. And so yesterday, the FZ1000 arrived and I took it for an initial spin. The FZ1000 is a chunky long, bright zoom bridge camera, it is not a pocket camera. It is roughly the size of an entry to mid level APS-C SLR body with a kit zoom. It is a little larger than my Lumix G7 m4/3 body. 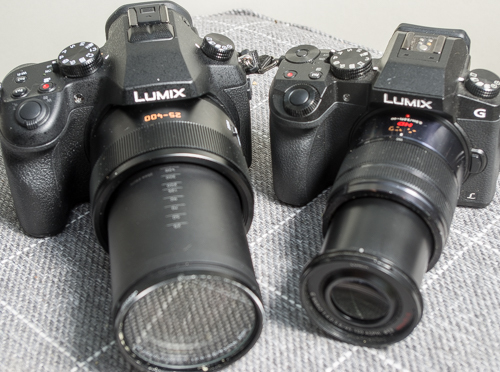 This shot shows the FZ1000 powered up in comparison to the G7 with the Lumix 45-150 f4-5.6 telezoom. You can see that the FZ1000 lens is both fatter and slightly longer – but it is a stop faster and 100mm equivalent longer focal length. Here you can see the S5Pro + Sigma lens dwarfs the FZ1000. This particular Sigma lens is 450mm equivalent on the APS-C sensor which makes it 50mm longer than the FZ1000 lens but maximum aperture is the same on both (F/4). The Lumix can of course zoom out to a f/2.8 25mm wide angle and macros focus to an inch or so while the short end of the Sigma is 150mm equivalent. The FZ1000 has 5 axis stabilisation to help keeps things steady while the Sigma has, er, weight. The FZ1000 with a UV filter, battery and card weighs in on my kitchen scales as 860g all in while the Fuji S5Pro + Sigma lens weigh a whopping 2400g. The FZ1000 has a substantial, chunky hand grip. It’s similar in shape to the G7 grip, just a little fatter, deeper and taller and with more pronounced finger and thumb hooks – which it needs because the G7/45-150mm is a very light combination and can get away with the slightly undersized grip, while the heavier lens on the FZ1000 needs a bit more support. Both grips are good enough that you could operate either camera one-handed if you had to. The controls on the FZ1000 are familiar if you have used G series bodies before. The FZ1000 lacks the twin control dials of the G7 and instead uses the same scheme has some earlier G series. The rear command wheel can be clicked in to swap between exposure compensation and shutter/aperture control. The readouts in the viewfinder change colour to indicate which mode is currently in use. The main mode dial, drive selector dial, function buttons and back buttons are all pretty similar to previous G series style cameras. Any who has used Lumix cameras will find it very familar. The viewfinder is electronic. Not everyone gets on with EVFs but I am used to them and enjoy the benefits of comprehensive viewfinder information, a preview histogram, level gauge and live preview. The view is large and bright and the 2million + dots on the OLED panel are sharp and clear even if it is not quite state of the 2018 art. Refresh rate is switchable between 30fps and 60fps. By way of contrast, the Sigma 100-300mm F/4 is a fixed 230mm long. The FZ1000 lens has a motorised zoom as well as motorised power up/down. Zoom can be controlled either by the fly-by-wire zoom ring around the outer barrel of by the P&S style zoom lever around the shutter release. You can have them both enabled if you can’t make up your mind. A switch on the barrel gives you the option of converting the zoom ring into a manual focus ring. You can’t re-assign it to anything else unfortunately (like aperture). The zoom lever can be reassigned to exposure compensation, however. Both the ring and the lever can be set to continuous stepless zoom or to zoom in increments equivalent to a popular focal lengths. Zooming is slightly quicker when in stepped mode and the zoom lever is faster than the body ring. Neither is as quick or precise as a mechanical zoom ring. Power up and power down is by a switch on the top plate around the base of the mode dial like most Lumix models. Power up is quite quick – by the time I’ve flipped the switch and raised the camera to my eye, the lens has extended and the camera is ready for action. So far, I have only used centre point AF-S mode. Subjectively, the AF is lightening fast, easily as quick as the G7 at all focal lengths. This is just a quick initial impression, so more on this after I’ve gained some proper experience under real field conditions. The FZ1000 is a modern Lumix – it has a lot of features and a lot of customisable settings. I need to get to grips with these and get it set up how I like it. I have a friend who uses Panasonic bridge cameras. She loves them. She’s the one who got me into digital back in the early 2000’s, with her 2 and 3 MP digital cameras and the excellent photos she was shooting with them at the time. I’m sure she would love the FZ1000, if she doesn’t already have one. I know I think it’s a great camera. Still, I think you might prefer to shoot with the Panasonic G9 and their long lens, when you go to Zambia. That’s a trip of a lifetime, and that camera does 4Kp60 video, has a better sensor, and will surely give you better image quality. The equivalent focal length on the long end will be longer too. The 12-60mm f2.8 lens would be a great walk-around lens for the G9, but it looks like you already have a good walk-around lens for m4/3. The value in the FZ1000 sure is there though. Please post more photos of the various parts of the camera and more sample shots too!